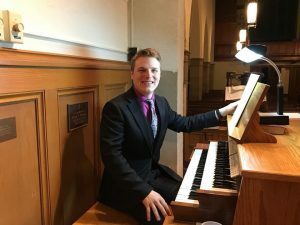 FULTON – Alan Lynch will play a recital on the Great Organ at All Saints Episcopal Church on May 10 at 7 p.m.
A freewill offering will be taken to benefit the Tuesday Night Dinner program at All Saints that provides a free dinner each Tuesday to anyone who is in need. Lynch currently serves as the organist and director of music at the Cathedral of the Immaculate Conception in Syracuse. He is also the organist and choirmaster of Church of the Savior Episcopal Church in Syracuse as well. He is currently pursuing a master’s degree in organ at Syracuse University under the direction of Dr. Anne Laver.